This intriguing book begins with a tragedy, in 1979, when the author’s cousin dies from injuries caused from playing with an unexploded shell. Losing the lad in such a way clearly had an impact on Peter Dekens, because his book, a photographic essay; delves into the profound sadness of a Flanders landscape beset by the unwanted legacy of a century ago. While other photographic books tend to seek out positive aspects of the battlefields – sunsets over war cemeteries, the beauty of nature overcoming man’s inhumanity to man and all that; Mr Dekens goes straight for the jugular by giving us images of a wounded landscape and the detritus of a conflict that will never go away. There isn’t much colour to start with and it all seems immensely gloomy. I could give you a selection of easy words from a thesaurus – stark, brooding, bleak; and so on and so on, but I think you get the picture. Trenches and No Man’s Land at Flanders Fields. There is another message ringing through the whole project and that is about the frailty of European unity. While the overall text is minimalistic, the emphasis is strong – Brexit and other examples of insularity are things to beware. 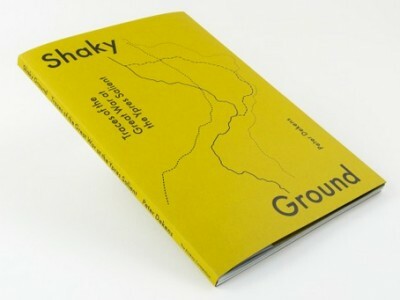 Shaky Ground offers a dual meaning from front to back. Now, I don’t want to get too heavily into this stuff because it doesn’t really fit into what I see as my remit for this gig and Brexit, in particular, is too raw a subject to bandy about when the saga is far from finished. Mainland Europeans inevitably have a perception that differs to those held by many people living on my island. But the wider point about how European disunity caused the Great War and World War II is entirely fair. But whatever Brexit leads to, I don’t think it will be the road to a nationalist fervour hastening in conflicts with our continental neighbours as seen a century ago. A further essay on the legacy of the war and modern attitudes by the historian Guido van Hengel is included, but it comes as an insert rather than being integral to the book. I’ll be honest and say I found this a strange decision, but the book is such a personal thing to Mr Dekens I can appreciate how it works. The author is mindful of the poison chalice heaped on Flanders as a convenient battlefield for it’s neighbours. There is an old bon mot that says Belgium is where the British Army plays it’s home games. The ghosts of Marlborough, Wellington, Haig and Montgomery might raise a rueful smile at this and they would not be alone. Thousands of lost soldiers are buried under Flanders fields awaiting planned or accidental discovery. A number of aerial reconnaissance photos illustrate how the landscape was obliterated, underlining the cost of warfare on such a relatively small area. 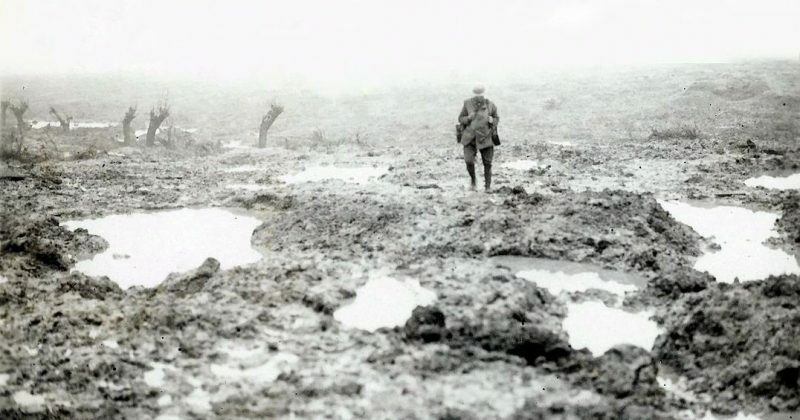 After the gloom Mr Dekens brings us into the light by looking at the people who do so much to record the history of the Ypres Salient – professional and amateur archaeologists, enthusiasts and pilgrims, munitions disposal experts – they all play a part. I found this element to be entirely positive – almost optimistic. The people shown really care about their battlefield and it’s legacy. The Ypres Salient will always have a special meaning for me. My great uncle Leslie was a 20 year-old volunteer soldier when he was killed at Hooge in August 1915. 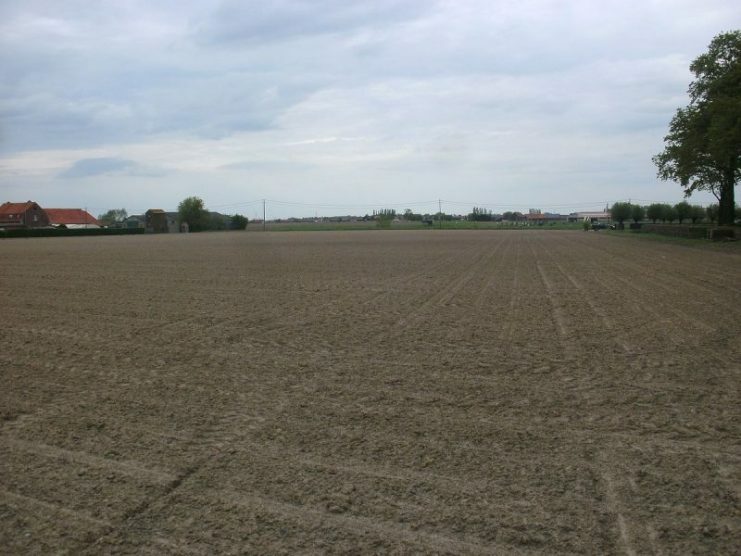 I have been into the field where he died and walked the path of the communications trench along which his body was taken out of the line for burial. I have a few photos, graves registration cards and copies of the letters his comrades wrote to my great grandmother saying what a brilliant bloke he was – a soldier, not a shirker. Les populates a Flanders of trench maps, battlefield tours, the Menin Gate, steaks and beers in the shadow of the Cloth Hall. Peter Dekens’ book presents a different Flanders with a deeper message while also offering something artistic and profoundly personal. This is the most unusual book I have seen this year. I cannot say how well it will travel but I do find it commendable and quite beautiful and am really pleased to have received it.